"Warm up" is a stop-motion video animation, realized by Eric Mutel. 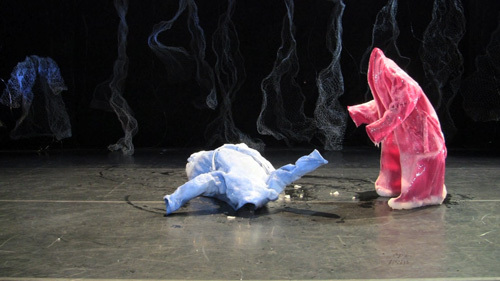 It has been recorded on the occasion (and could be made thanks to it) of the creation project Svartisen, dance/acrobatics performance, by Pirjo Yli-Maunula and Ilona Jäntti, in Oulu, Finland, 2011. You can watch the short video in HD on Vimeo. Or as a low Resolution on the site link Here. During a dance rehearsal, 2 frozen coats got into unexpected movements. 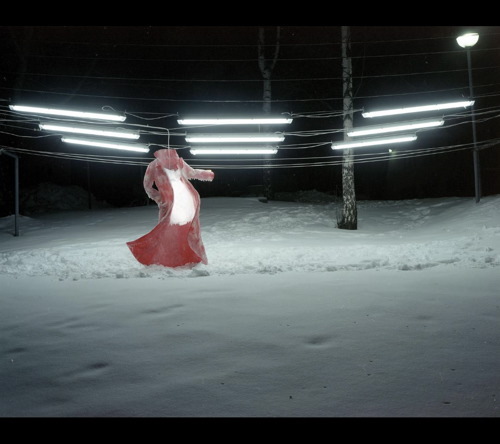 Frozen coats, realization, stop-motion, editing, sound arrangements by Eric Mutel. 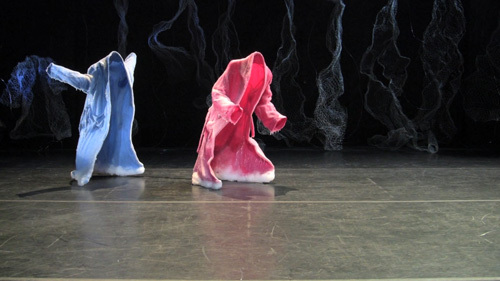 Eric Mutel started to develop photo works and installation with frozen coats in 1997, and more recently, since 2004 has developed further this work for performance/dance performance, stage design/installation and for stop-motion video. Frozen coats took part recently in the new production "Svartisen", circus and dance performance, project by Flow Productions, Pirjo Yli-Maunula, premiered in Oulu, in March 2011. This video was shot during the production of "SVARTISEN", dance and circus performance, project by Flow Productions, Pirjo Yli-Maunula. Oulu, Finland, 2011. The video was shot on the Svartisen's project's stage, using the set design of the show in the background and a part of lighting design of the show. -Videoholica International Video Art Festival 2012, Varna, Bulgaria. -Wallpaper Dance Film Festival 2012, Trieste, Italy. -Loikka Dance film festival 2012, Helsinki, Finland. -Hip hop Festival, waga hip hop 2011, Ouagadougou, Burkina Faso. -Waterpieces video festival 2011, NOASS, Riga, Latvia.